Elanco - 100 gm. A water soluble antibiotic powder (Tylosin Tartrate) for oral use. Indicated for use in turkeys to maintain weight gains and feed efficiency in the presence of mycoplasma gallisepticum. Aids in the treatment of chronic respiratory disease (CRD) caused by mycoplasma gallisepticum or synovia in broiler and replacement chickens. Treatment runs from 2 to 5 days. Do not slaughter chickens within 24 hours after treatment and 5 days after treatment for turkeys. Do not use eggs for human consumption. Dosage: mix contents of package in a one gallon mixing container add this concentrated solution with water to make 50 gallons of treated drinking water. Withdrawals: Turkeys: 5 days; Chickens: 24 hours; Swine: 48 hours. Also labeled for Honey Bees. Follow label instructions per species. See below for more details on each. One jar contains 100 grams of Tylan® Soluble Powder and will make 400 gallons treated drinking water for swine and 50 gallons of treated water for poultry. Generally, a jar of Tylan® Soluble Powder will not expire until approximately 18 months after purchase. 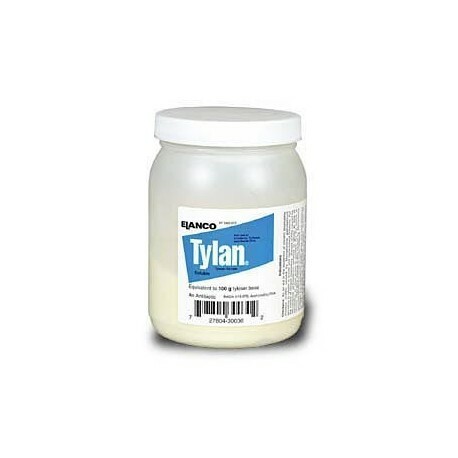 Tylan® is a registered trademark for Elanco's brand of Tylosin. Chickens: When chronic respiratory disease threatens birds and slows gain, strategic medication with Tylan® Soluble can help protect flock health and profitability. Tylan® Soluble is highly active against Mycoplasma. Swine: Tylan® Soluble is approved for use in swine for the control and treatment of swine dysentery (bloody scours) caused by pathogens sensitive to tylosin. Recommended Use: Medicated drinking water should be offered as the only source of drinking water for 3 to 10 days. A withdrawal time of 48 hours is required prior to slaughter.